With three units to go and not too much longer in Kenya, I was starting to get nervous. Would we be able to catch all the birds in time? I had my hopes set on one more Lappet (at least), one more adult African white-backed vulture, and perhaps another juvenile Ruppell’s. For this last set of trapping I was to work with a Ugandan student who wanted to learn how to trap vultures. Hoping to begin a large research project (possibly the makings of his PhD) on Lappet-faced vultures, Richard wanted to know how to trap, handle, attach units, and draw blood from these majestic birds. I had explained to Richard that Lappet-faced vultures could be quite difficult to catch and that I couldn’t guarantee we would get one during his stay, given my ever-tightening schedule. I was soon eating my words. The first morning out we found carcasses, but not the birds we wanted. We drove up to the fighting masses of birds only to find almost all adult Ruppell’s vultures and juvenile white-backs, exactly the birds we didn’t need to catch (since we had already put several units on them). I was starting to loss hope when 10:30 rolled around and we hadn’t set a trap yet. Then we happened upon a very small carcass – little remained of the wildebeest calf with its head ripped open previously (most likely by a hyena) and just a bit of fur. But the Lappet-faced vulture pair had stayed on the ground as we set the trap and had been eating furiously before we disturbed them so I was hopeful. Another 15 minutes went by and the Lappets took off and relanded on the kill. Within minutes they were feeding. When one jumped back but didn’t go too far, it certainly looked like we had trapped it, but I couldn’t believe it. It was never this easy. We drove up cautiously just in case our eyes deceived us, after all the bird certainly didn’t seem concerned. Sure enough a noose was secured to its foot and I was soon racing around getting all the materials out so we could attach the unit to the bird. A beautiful adult, part of a pair, the animal stayed calm as we attached the unit and took some blood. Even as we released it I couldn’t stop smiling. We had managed a Lappet-faced vulture on Richard’s first day. 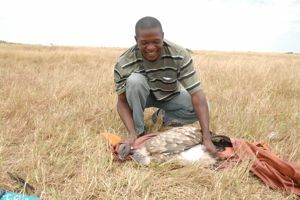 An adult white-backed vulture proved particularly elusive – possibly due to the large declines but possibly due to their ability to find the carcasses quickly and get full early. On our third day (of this third round of trapping), we managed a juvenile Ruppell’s to which we attached the second to last unit and on the fourth we caught four birds at once. Nearly one of each combination – a juvenile Ruppell’s, adult Ruppells, juvenile white-backed, and finally an adult white backed. We let the others go and attached the final unit to the adult bird. I felt a ting of sadness and relief as we let the last one go. With no more units planned for this project, I wondered how long it would be until I handled another vulture. Anyone who owns a cat knows that most felines don’t like water. The tiger is perhaps the one exception – famous for its love of swimming. Lions on the other hand are generally known to avoid water. So most of the time when you see them near a river or small pool of water they are looking for a drink and nothing more. 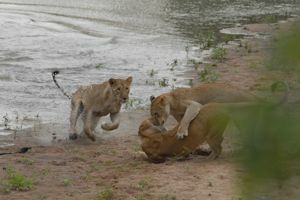 That’s why I was incredibly surprised to see not one but four female lions playing in the Talek River. The cats began by chasing each other around. Hiding in the bushes only to leap out and run full speed into the glistening river as they grappled at their pride-mates. With all the raucous you’d imagine that most animals would be aware of the danger nearby, yet all the noise didn’t stop two foolish Egyptian geese. As the four lions had moved off onto alternate sides of the bank, the geese landed in the middle only to notice an enormous female lion jumping from the bushes directly at them. It wasn’t much of a chase and the geese were soon airborne as the lions went back to playing with each other. After their romp, the lions eventually moved back up the bank for a rest and clean. As one lion went to roll over, she nearly fell through a small crevice in the bank. She grabbed at the dirt with her claws and eventually was able to right herself, but I had never seen such clumsy behavior from an adult lion.